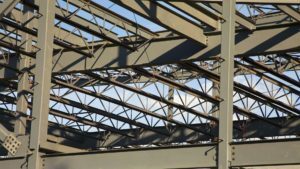 The key component of your buildings, roofs, and floors are steel joists. Joists are lengths of steel used in support of a foundation for a ceiling or floor. Often, joists are arranged in horizontal, parallel patterns. We carry steel joists and can size them for your construction needs. Steel joists also come galvanized. They are also extremely flexible and sturdy, so damage is rare. Proper use of joists will guarantee that your building is able to withstand natural disasters for years to come. Just like a healthy heart, a strong joist layout will keep the building safe and secure. What are Joists Used For? Joists are commonly used for floors, ceilings, and roofs. In floors, joists are typically placed equidistant and parallel from one another. The size and amount of distance between joists depend on building codes as well as the structural engineering of the project. Decking refers to the sheets of metal installed above joists to form the foundation for a ceiling or floor. At Steel Specialties, Inc., we have the ability to meet your job capabilities, whether it’s a small one-floor office or a multi-story building. With the assistance of our experienced estimators and detailers, your job requirements will be met with precision. What is Decking Used For? Metal decking is utilized in a wide variety of industrial and commercial projects. This includes steel roof and floor decking. For metal decking, the surface is normally ribbed and has a corrugated profile. Typically, metal decking is used for flooring and roofing but can also be used for different forms of concrete tasks. The installation involves screws or pneumatically driven pins but can also be welded. Steel decking is typically galvanized to prevent rusting. Floor decks: Steel decking provides a stability to structural frames when used in flooring. Roof decks: For roof decks, decking increases the strength and support of other roofing materials. The standard types of roof decks are B, F, N, and A. They come in a variety of depths, gauges, and finishes. Floor desks range from 0.6” to 3” in a variety of panel widths, gauges, and finishes. For specific sizes available in our inventory, please contact us directly. Steel Specialties, Inc. is a supplier of joists and decking in El Paso and its surrounding areas. If you’re in need of this construction service, please contact us for a one-on-one consultation. We can be reached at sales@steelspecialtiesinc.net or feel free to give our office a call at 915-590-2337.